I remember the day very clearly; we were at the pediatrician’s office because one of my kids was sick. Our doctor came in and looked the child over and then proceeded to talk to me. “Mom,” he said, and then told me what was wrong with my daughter. As we were getting ready to leave he again addressed me as “Mom”. I stopped him and said, “Can I ask you something?” He said sure and so I asked, “Do you know what my name is?” He was taken aback. He blushed a little and said, “No, I don’t. I’m sorry.” I smiled and told him, “The reason I ask is that we have been coming here for years and not once have you ever addressed me by my name. I am more than just a mom. When all anyone sees of me is a mom they miss out on so much of who I am. My name is Michelle.” He looked embarrassed and apologized to me again. From that moment forward he has always addressed me as Michelle. I truly believe that my relationship with our doctor, whom 20 years later I consider a friend, is even better than it was before simply because he knows my name. While I never meant to embarrass him, it was important to me that he knows my name. I love being a mother and it is my primary vocation, I also know that I am more than just a mom. I think that most of us would agree that we want others to see us for who we really are and not just one aspect of our nature. When I think about this chapter and about the story I just told, I think that Jesus felt the same way. He wanted, no He needed the people to see Him for who He truly was. He was more than just a great teacher, more than a prophet… He was God; the second Person of the Trinity. Everyone knew His name but they still didn’t understand who He was. He was the Son of Man. His claim was shocking and would be blasphemous if it were not true. A couple words stuck out to me in this chapter- divinity and awestruck. If Christ was not lying, and of course I don’t believe He was, then His divinity is amazing. When we see His power laid out within Scripture it’s hard to wrap our minds around all the things He said and did. What would it have been like to see a paralytic man pick up his mat and walk away? 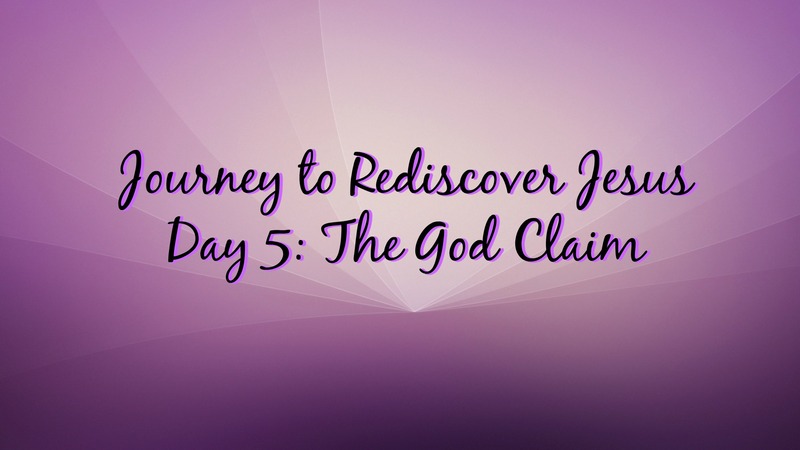 What would it have been like to be in the boat with Jesus as He calmed the waters of the sea? What would it have been like to see Him raise a man from the dead? I have no doubt that I would be awestruck. Another reason the word awestruck stuck out to me is that I think about how my children react when I come home after being gone for any amount of time. They are excited and joyful that I am home. They often rush out of the house to greet me at the car. It makes me think about Christ and how we should react to Him. Do I rush out of my house to greet Him at church? Do I readily jump out of bed to start my day so that I can dedicate all that I say and do to Him? Do I easily set aside time to pray? Most of the time, my answers to all of these would be no. Why? When I look at all Jesus said and did and I know who He truly is, why am I not awestruck enough to rush to greet Him and encounter Him in all I do? Shouldn’t I be as joyful to see Him as my children are to see me? Point to Ponder: Jesus is speaking directly to you in the Gospels. When someone speaks to us we want them to know our names. In our everyday lives we want them to address us personally. Christ does this in the Gospels and yet all too often we ignore Him. Perhaps we should be listening closer and we should take the time to hear what He is saying to us. He calls us by name and He speaks to us directly. He wants a relationship with us. Will we hear Him and respond? It’s easy to get lost in this world. In a world that doesn’t see who we truly are it’s easy to feel dead inside. But Christ sees us and He knows our names. Like Lazarus he calls us to “Come out!” and he tells us that those who believe in Him will not die. He is the Way, the Truth, and the Life. We must live our lives following Him. Question to Consider: What’s holding you back from believing in Jesus completely? I don’t think that I have a problem believing in Jesus completely. Instead I have a problem with control and trust. I suppose I worry that Jesus won’t see my needs and then they won’t be taken care of in the manner that I think they should. I worry that giving over control and trusting completely that He will take care of me will bring me disappointment in the end when things do not go the way I hope they do. I think I worry about being forgotten… that He won’t remember my name. Your Turn: How important is it to you that people see you for who you truly are? Have you encountered a time when you felt invisible? How can Jesus, Son of Man, help you to understand your true worth? What is holding you back from trusting in Jesus completely? Prayer: Lord Jesus, I trust in you. Lord, I know you are the Way, the Truth, and the Life; help me to follow you even when it is difficult and I feel alone. I know you know my name Lord and you are always here with me; help me to know you better and to always praise your name. Amen.